The High Stakes Challenge is one of the online rummy tournaments in which you will have an opportunity to play against professional VIP players of Junglee Rummy. 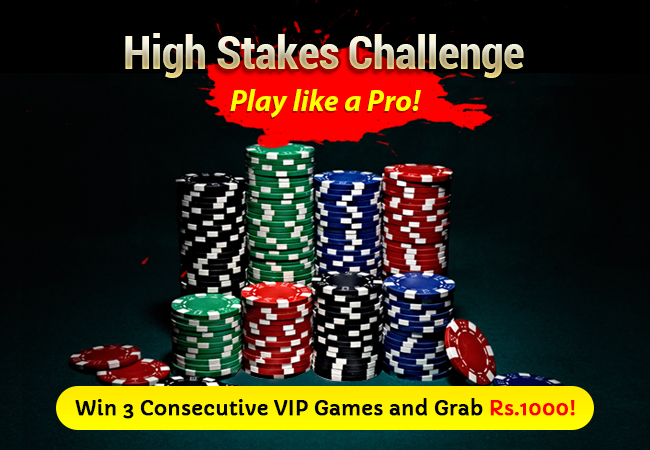 In order to take part in VIP online tournament, you have to join the table with a fee of Rs.2000. Once you start playing and win 3 consecutive matches, you are eligible to win cash prizes worth Rs.10,000. Only the first 10 players will get the benefits. So try to defeat other worthy professionals as soon as possible. It’s a challenge you should take if you want to prove yourself as one of the best online rummy player. Midweek Master online rummy tournaments are your chances to show off your skills and win maximum games during the promotion period. You can win up to Rs.25,000 in cash prizes. The promotion will start on 16th July 00:01 hrs and will end on 17th July 23:59 hrs. Race to Riches is an online rummy leaderboard tournament in which you have to beat your opponents in the promotion period of two days to rule the leaderboard and claim the winning amount. The top 20 players will share the winning amount of Rs.50,000 according to the points they have at the end of the tournament. These 3 online rummy tournaments will prove how good you are in online rummy games. It’s your best chance to earn some real cash and fame from the online community of rummy players. To know more about other rummy promotions and bonuses, click here.